View of the new apartment hotel Hanneman Holiday Residence from the pool and gazebo area. All the holiday apartments of Hanneman Holiday Residence are fitted with stylish furniture. This is the lounge and dining area of the Penthouse 2-bedroom. Elegant bedroom in the 2-bedroom Penthouse with king size bed, sofa bed, air-conditioning, study corner and en-suite bathroom. 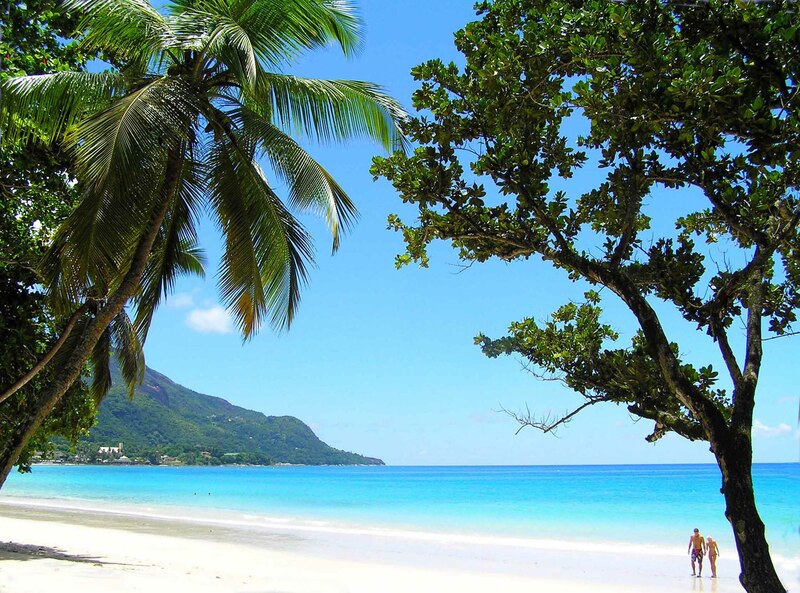 The Beau Vallon Beach is one of the most beautiful beach in Mahé, Seychelles, ideal to watch the glorious sunsets and swim in calm waters. It is 5 minutes walk from the Hanneman Residence. Large verandah of the 2 bedrooms Duplex apartments of Hanneman Residence for outdoor dining and relaxation. Enjoy the warm evenings and nights of the Seychelles seated in your private verandah. 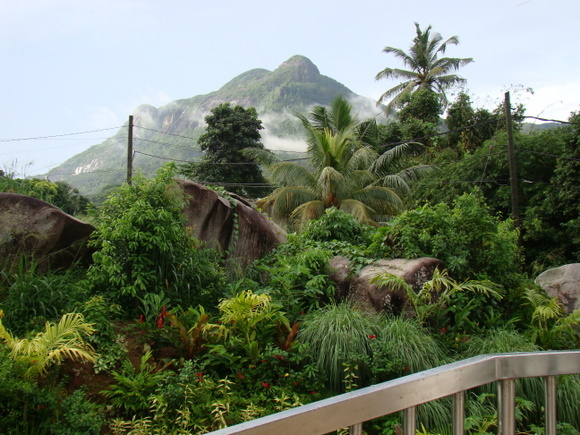 Tropical gardens and moutain-view form part of the tranquil surroundings of Hanneman Holiday Residence. 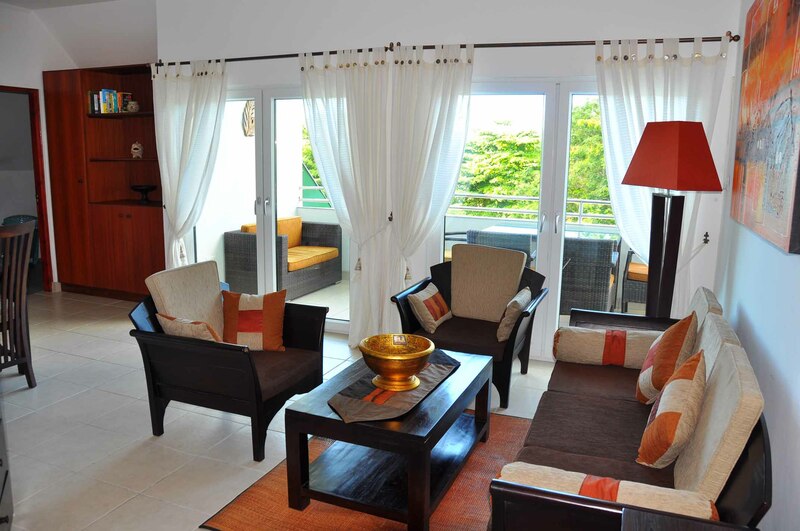 All apartments of the Hanneman Residence in Seychelles are self-catering. 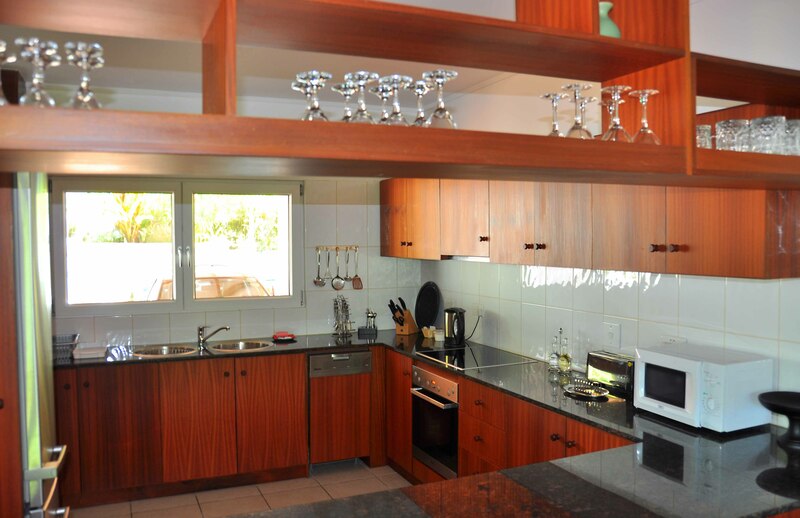 They feature open-plan kitchen fully equiped with he most modern and brand new machinary. You will enjoy preparing the delicious fish and discover vegetable and tropical fruits bought at the lively market of Victoria, 5 km away. Relax at Infinity pool and sunbathe on the comfortable loungers. Drinks and BBQ can be served in the swimming pool area. Free WiFi available in all Apartments !!! 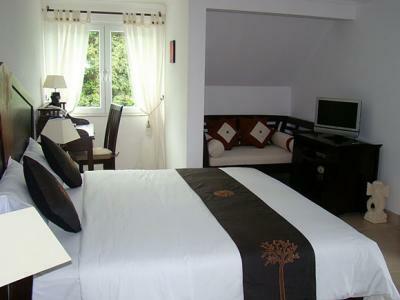 The Duplex consist 2 air-conditioned bedrooms each with en-suite bathroom with shower located on the first floor. 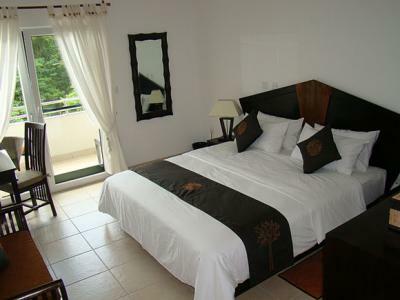 The master bedroom has a king-size double bed and the second bedroom twin beds. 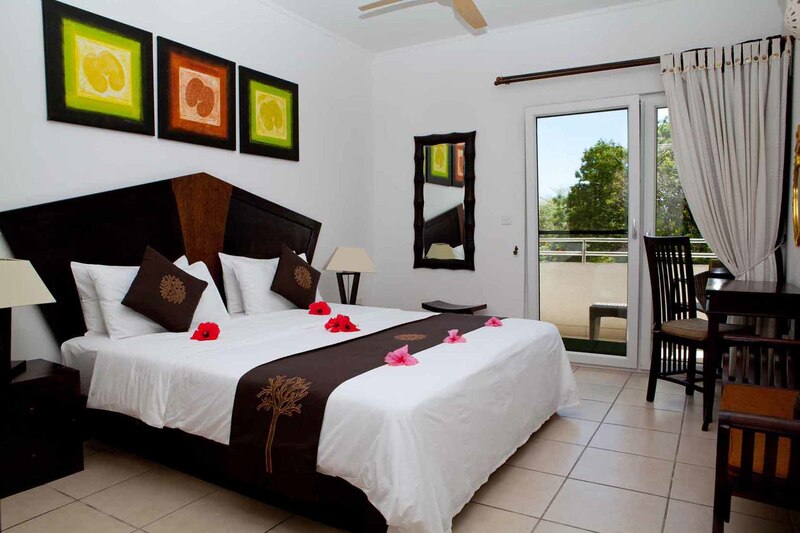 Each room has a room safe, ceiling fan and a private terrace. Downstairs there is a large open-plan full equipped kitchen including dishwasher and fridge/freezer, with a spacious living and dining area with flat-screen TV, ceiling fan, guest toilet, washing machine with integrated tumble dryer, and a furnished balcony of 20 m2 catering for outdoor dining and relaxation. The Penthouse with 1-bedroom consist an open-plan fully equipped kitchenette with dishwasher, 4 plate stove, fridge/freezer and a dining area. The separate air-conditioned bedroom with en-suite bathroom and shower, has a flat-screen TV, study corner, small balcony, sitting area and storage room. There is a washing machine with collapsible drying rack. The Penthouse with 2-bedrooms is a spacious 145 m2 unit on one level with a separate fully-equipped kitchen, living and dining room with flat-screen TV, ceiling fan, guest toilet and furnished balcony of 18 m2. There is a separate laundry room with washing machine and integrated tumble dryer. The large master bedroom with king-size bed is air-conditioned with sitting area, study corner, storage room, private terrace and en-suite bathroom and shower. The second air-conditioned bedroom also has a king-size double bed with private terrace and en-suite bathroom with shower. 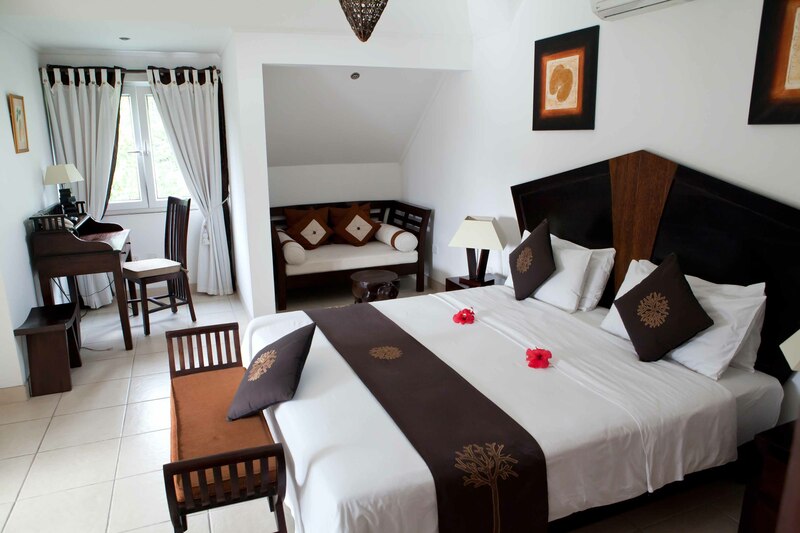 The Terrace Studio consist a king-size bed with air-conditioning and ceiling fan, lounge area with small library, open-plan large kitchenette which is fully-equipped including dishwasher and washing machine. There is a separate bathroom with shower and 220V razor plug. The Terrace Studio opens out onto a small garden with outdoor dining table with sun umbrella and beach beds overlooking the pool area. All bedrooms have air-conditioning, ceiling fan, room safe and bathroom with shower and 220V razor plug. In the vicinity of the residence is a selection of good restaurants. There are also take-aways, island shops where guests can buy provisions, a bus stop and ATM machine. A variety of evening entertainment is on offer such as discotheque, casino and local dancing shows. 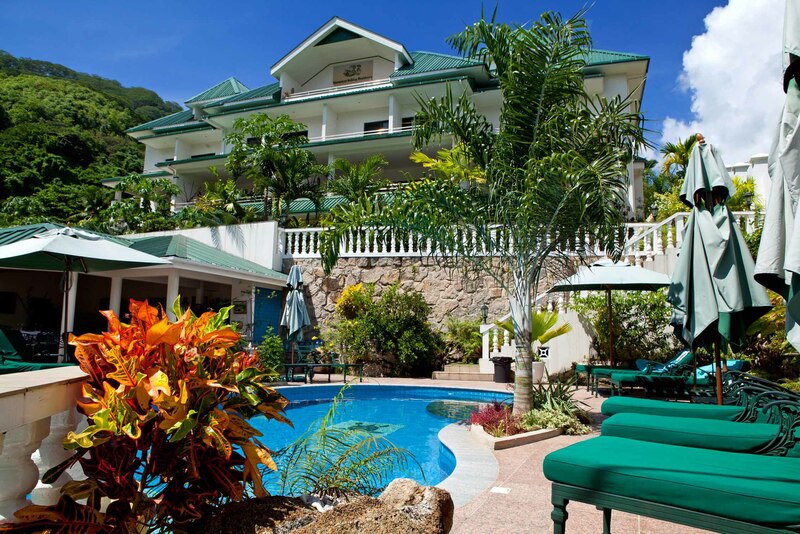 From the Hanneman Holiday Residence you can take a 5 minutes walk to Mahé´s most popular beach, the Beau Vallon Bay which is renowned for its adundant marine life and diving opportunities. Here you will find 3 kilometers of white sand and turquoise-blue waters of the Indian Ocean where you can swim year round. 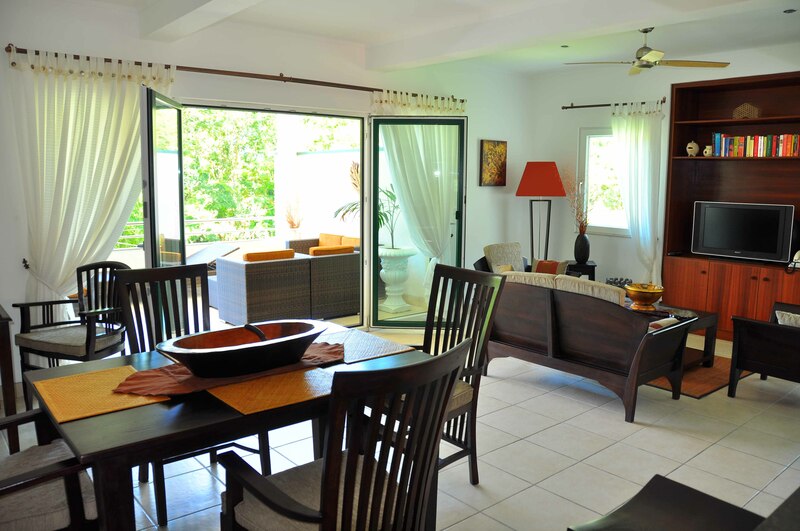 This property offers it's guests the option of catering for themselves in addition to enjoying the comforts of a spacious fully equipped apartment in an ideal location. 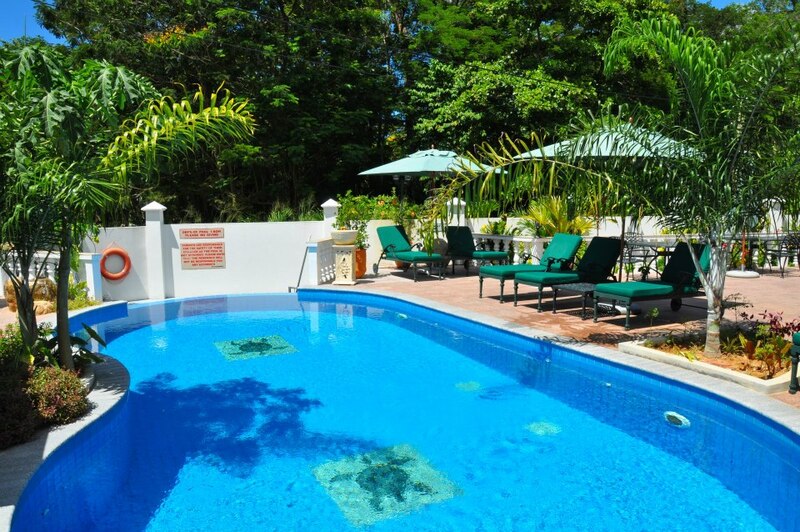 Nearest Beach: Beau Vallon Bay – walking distance approx. 5 min. Airport: Seychelles International – driving distance approx. 30 min. Harbour: Inter Island Quay – driving distance approx. 15 min. 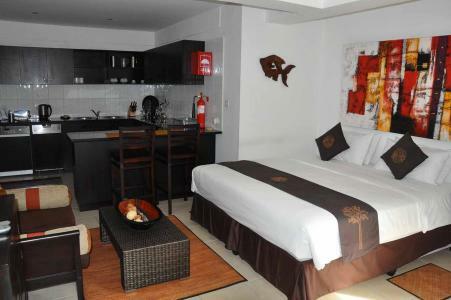 Comfortable and cosy studio with air-conditioned bedroom and open-plan kitchenette and lounge, with seperate bathroom. Can accommodate 1 or 2 persons. Grand elegant 2-bedroom duplex with large open-plan kitchen on ground floor and 2 bedrooms each with ensuite bathroom and private terrace on 1st floor. Can accommodate up to 6 persons. 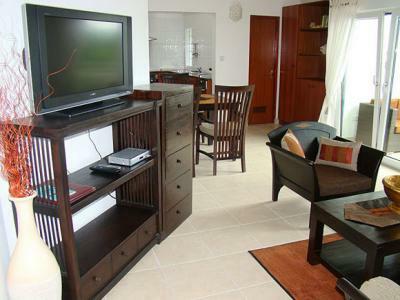 Spacious luxurious self-catering 2-bedroom Penthouse apartment on one level. Full amenities including airconditioned bedrooms, flat-screen satellite TV and internet, seperate fully-equipped kitchen and large terrace for outdoor dining and relaxation. Can accommodate up to 4 adults + 1 child under 6 years. Large 1-bedroom penthouse apartment with a dining nook and kitchenette, leading to the seperate air-conditioned bedroom withe en-suite bathroom and shower and own balcony located on the third floor.